Experimental poet Christian Bök’s first book, Crystallography, is a “’pataphysical encyclopedia” of language and geology; his second, Eunoia, is a univocal experiment inspired by Oulipo constraints. His third project, The Xenotext, ten years in the making, takes the idea of poetic experiment, implicit in the method of his previous books, literally. The Xenotext is a sonnet encoded into the DNA of an E. coli bacterium, which then re-encodes a new sonnet of its own genetic devising. This makes it, Bök claims, the first “living poem.” The oft-quoted lines of these dual poems are “any style of life/is prim” and “the faery is rosy/of glow” — the opening lines of, respectively, Bök’s poem (called “Orpheus”) and the bacterium’s response (called “Eurydice”). Though the sonnet is currently written in (or by) the DNA of an E. coli bacterium, Bök writes that its ultimate home will be within “D. radiodurans (a germ able to survive, unchanged, in even the deadliest of environments).” The project of The Xenotext seems to be about two things: creating a living poem, and creating a work of art that will last forever, or at least past the extinction of the human species. Is it fair to suggest that an aesthetic project that uses the life of another creature for egotistical, even masturbatory ends is morally and ethically suspect (if not repugnant)? Even now, the astronauts have marshaled their forces to march, resolute, across the kill zone of your godforsaken crematorium. Even now, they forge ahead, onward, through war games of wildfire (unaware that, far away, a doomsayer murmurs prayers against them from a fiendish grimoire). Attended by a chorus of potentially hazardous objects from asteroids to prions, Virgil narrates humanity’s descent backwards through history into the Hadean Eon and into the future to the death of the Sun. The Xenotext: Book 1 is self-consciously grandiose, evoking apocalyptic destruction of classical, not to mention pre-Holocenic, proportions. As Bök’s frequent allusions to environmental science suggest, that evocation is not the product of his imagination. Whether or not “Anthropocene” is the correct term for the current epoch, we are in the midst of a mass extinction event of our own making. No, the threat of mass extinction is not only real, it is happening. The language of The Xenotext: Book 1 is gorgeous in the way that a good translation of classic Greek or Latin is gorgeous: lush and urgent, multisyllabic and rhythmic, “classical” in a way that still feels new. 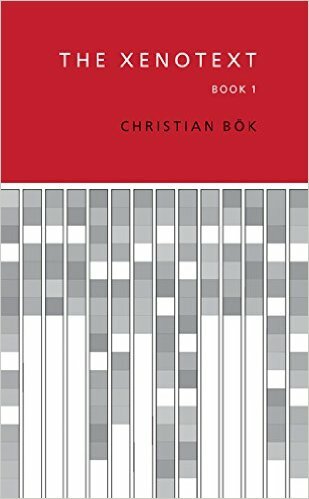 There is a delightful sense of play, not just urgency, driving these creations: Bök has taken the structures of amino acids as a model for the formal constraints of many of these poems, resulting in an impressive array of forms. The prose poems that open and close the book — “The Late Heavy Bombardment” and “Alpha Helix” — are nothing short of extraordinary. Between them sit three longer pieces: first, “Colony Collapse Disorder,” which frames Bök’s translation of Book IV of Virgil’s Georgics on the care and keeping of bees with an “exordium” excerpted from a paper by Harvard School of Public Health professor Chensheng Lu. (Lu’s work is at the center of the environmentalist movement against neonicotinoids, a class of neurotoxic pesticides argued by many to provoke colony collapse disorder in honeybees). “The March of the Nucleotides” is composed of a number of smaller poems that are formed of or inspired by various genetic ‘building blocks.’ The final section, “The Virelay of the Amino Acids,” is similarly constrained, and uses a limited vocabulary based on the molecular composition of a suite of amino acids. These are grand poems for the Anthropocene, no doubt about that. On their own, the poems of The Xenotext: Book 1 are impressive; but one cannot ignore the fact that they are a small part of Bök’s overarching project of writing a poem into a bacterium’s DNA. It is impossible to review The Xenotext: Book 1 without also reviewing The Xenotext as a project: indeed, one of astonishing scope and ambition, but ultimately limited range. It may be the result of a ten-year arc of planning and preparation, yet the Xenotext feels like nothing so much as high-tech genetic graffiti: “Christian wuz here” in microbial verse. This feels like a strange and inappropriate question to ask of poetry, but — why? Bök implicitly compares his project to Joe Davis’s Tree of Knowledge. To create the Tree of Knowledge, Bök writes, “Davis has translated 50,000 entries from a computerized encyclopedia, converting them into strands of DNA, to be implanted in to cells of saplings, then grafted to apple trees.” Unlike the Tree of Knowledge, however, the Xenotext does not seek to encompass the whole of human culture, history, or craft. What it does seek to do, along with the rest of Bök’s oeuvre, is respond in a meaningful way to scientific advancements of the 21st century, particularly in the realm of microbiology and genetics. As a whole, The Xenotext is a staggering work; however, the individual diptych of the Xenotext is a much more dubious object. Eleanor Gold is a graduate student and Reviews Editor for Full Stop who lives in Buffalo and is currently trying to turn her love of weird, squishy animals into an applicable methodology for cultural studies.